Google canceled the Android event today due to the hurricane, but the expected products were still announced. Take a gander. A new phone, the Nexus 7 was announced. The specs are below, with comparison to the previous Nexus and the recently announced iPhone 5. Most interestingly, it will support wireless charging. The pricing of the Nexus 7 has been reduced. Formerly, the 8G version was $200 and the 16G version was $250. Now, the 8G version is discontinued, the 16G version is $200 and the 32G version is $250. Also, a version with 32G and HSPA+ data will be released on November 13 for $300. A new Nexus 10-inch tablet with an extremely high resolution amazing display was announced. The Nexus 10 is 300ppi. For comparison, the iPad 3 and 4 are 264ppi. 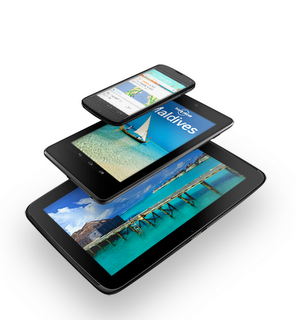 The Nexus 10 will be available for $400 (16G) and $500 (32G) on November 13. An incremental version update to Android, still called Jelly Bean, accompanies the devices. As expected, it will support multiple users (on tablets). This could be an important feature for shared tablets. Android 4.2 comes with an update to Google Now which adds flight information, restaurant and hotel reservations, and shipping details. Android has had panoramic photos for some time, but now that Apple has it, I guess it's time for something new. This new feature produces StreetView-inspired 360-degree immersive experiences, shareable on Google+ and Google Maps. This is potentially interesting. Android 4.2 also includes Gesture Typing, which sounds like direct competition with Swype, and now SwiftKey Flow. The announcement included unexpected updates to the Google Music service. First, they will have a matching service. Apple was first with iTunes Match, and then Amazon with their Cloud match (both $25/year), and now Google comes along with their matching service (free). The benefit is that music files can be matched against the content library and users can access music they legally own without having to upload it all. For people with large mp3 libraries, this is a much quicker way to get started with online music. The matching service will come to Europe first on November 13. Google also announced a partnership with Warner Music Group, the major label holding out from listing on Google Music.